William Coates are Proud to Support the St Catherine Children & Educational Centre, Nairobi, Kenya. 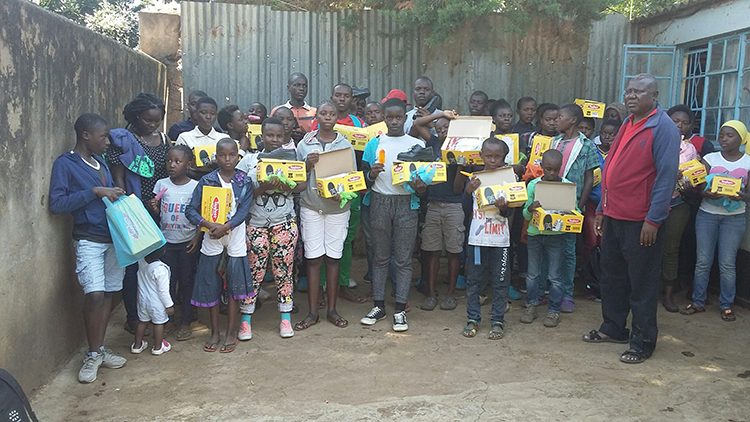 William Coates have been supporting the St Catherine Children & Educational Centre, Nairobi, Kenya for the past 8 years and we are one of their main lines of support. 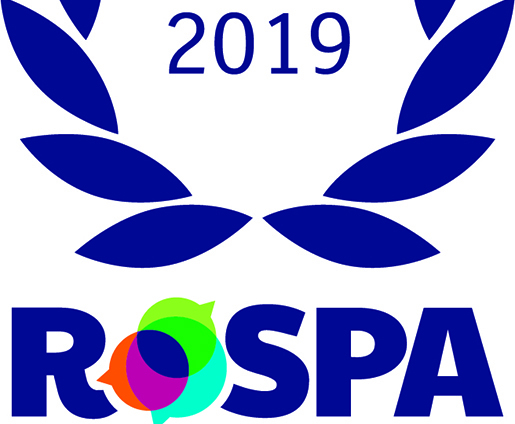 William Coates Win Gold again at the 2019 RoSPA Health & Safety Awards. 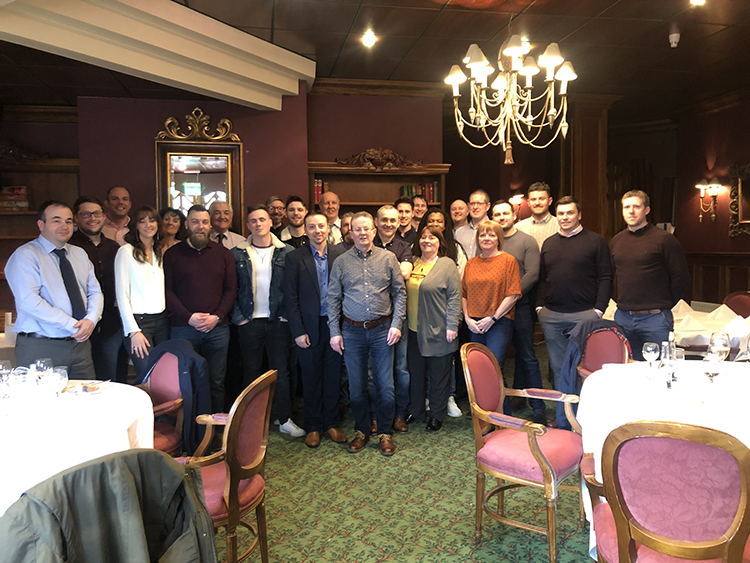 William Coates Mechanical & Electrical Engineers has achieved a Gold in the internationally-renowned RoSPA Health and Safety Awards, the longest-running industry awards scheme in the UK. William Coates Senior Electrical Estimator Pat Mulholland Retires. 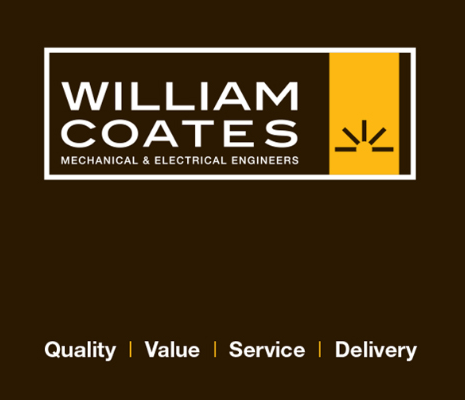 William Coates Senior Electrical Estimator Pat Mulholland recently retired after 31 years of employment at William Coates. 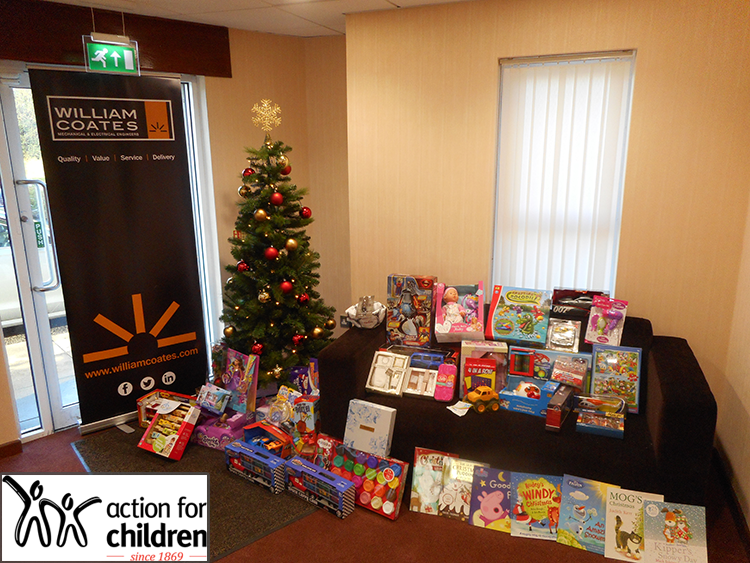 William Coates have Donated to the Cash 4 Kids Mission Christmas Christmas Gift Appeal. 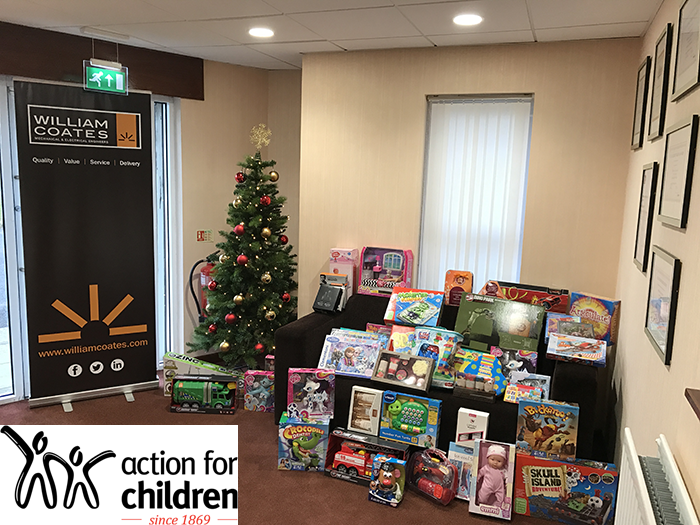 William Coates employees have been extremely generous and donated a great range of gifts to Cash 4 Kids Mission Christmas Gift Appeal. William Coates Staff Christmas Jumper Day and Coffee Morning for the Cancer Fund for Children. William Coates held a staff Christmas Jumper day and coffee morning for the Cancer Fund for Children. 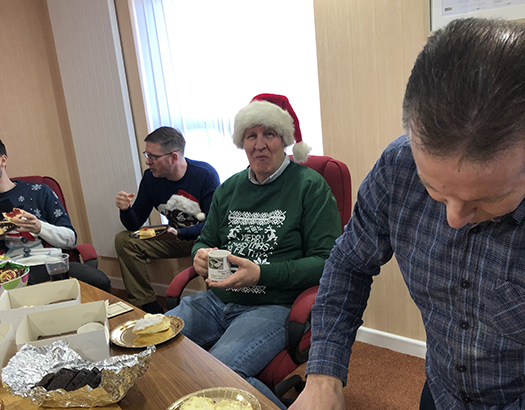 All of the office staff got into the spirit of Christmas and donned a variety of Christmas jumpers and they attended a coffee morning were a great section of goodies were on offer. Getting Results through a Positive Mental Attitude Workshop. 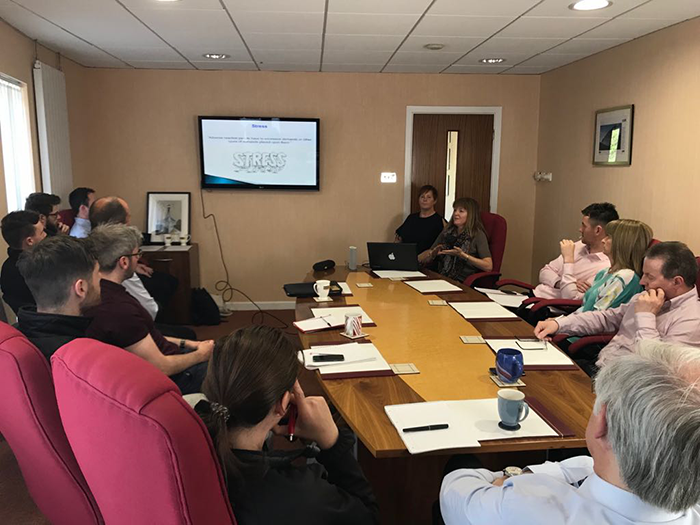 Kim Calvert from Dynamite Lifestyle recently delivered a Getting Results through a Positive Mental Attitude work shop for some of the William Coates team. Business in the Community NI, 2018 NI Environmental Benchmarking Survey 2018. 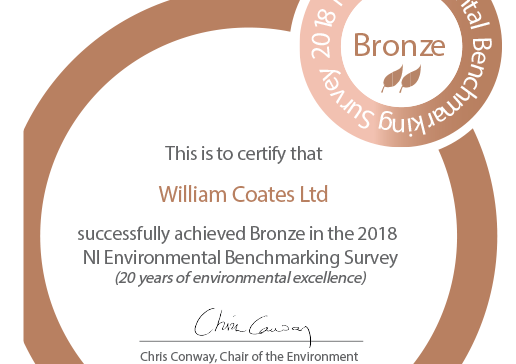 William Coates Ltd has achieved Bronze status in this year’s Northern Ireland Environmental Benchmarking Survey. Gary Mould’s Scores Points in World Grand Prix Debut. 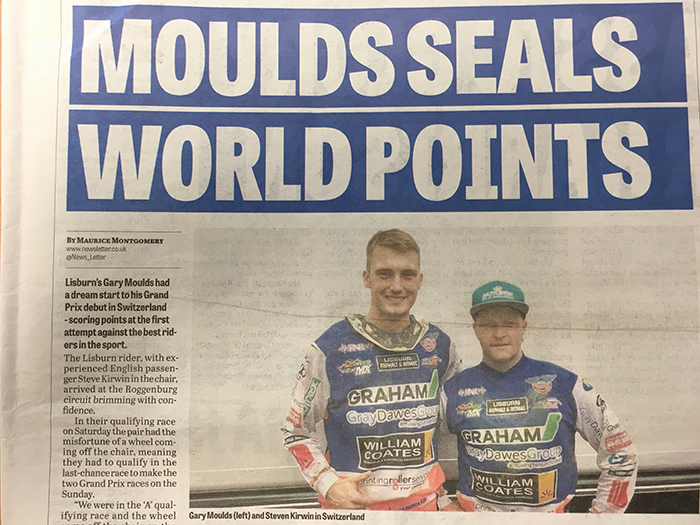 Well done to Gary Moulds on his Side Car Grand Prix Debut in Switzerland - Scoring Points at the first attempt against the best riders in the world. William Coates Employee Summer BBQ. 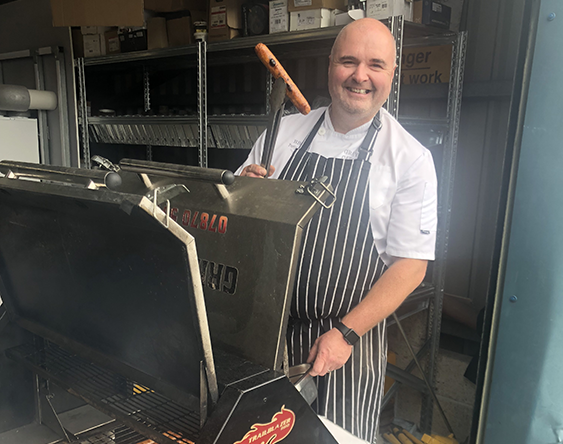 As a thank you for the hard work our staff put in throughout the year and their fundraising efforts for our nominated charity Mencap NI William Coates held a BBQ at head office. 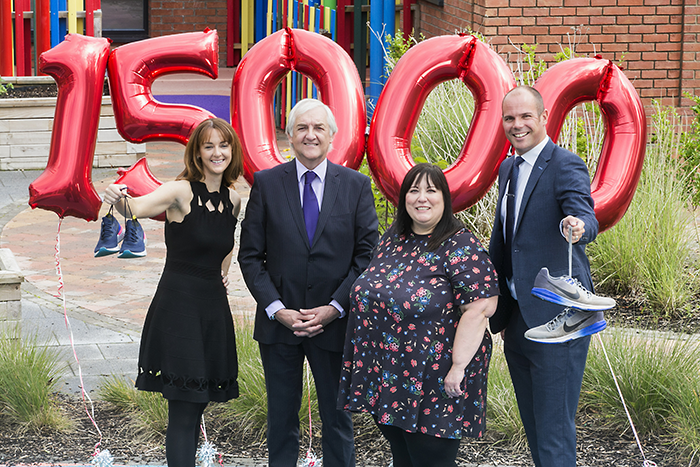 William Coates Raise £15,000 for MENCAP NI. 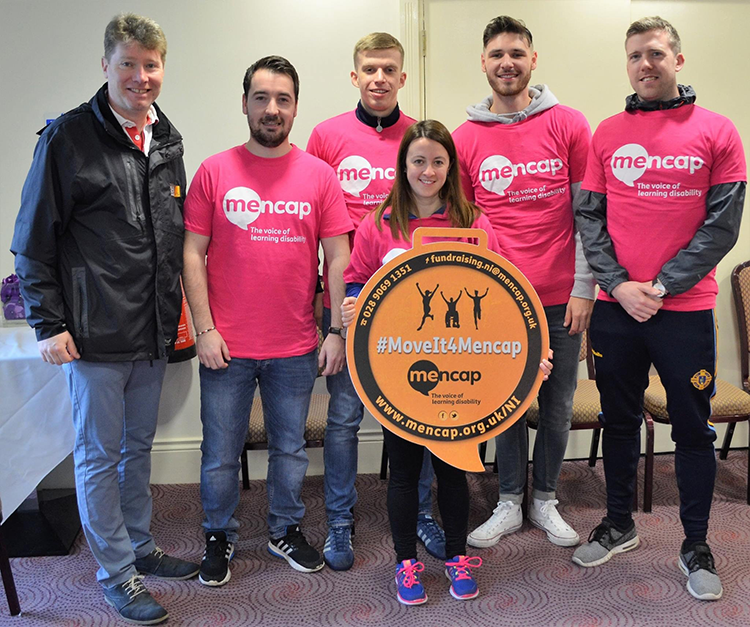 Mallusk based electrical and mechanical engineering company William Coates has raised a staggering £15,000 for local charity Mencap NI. 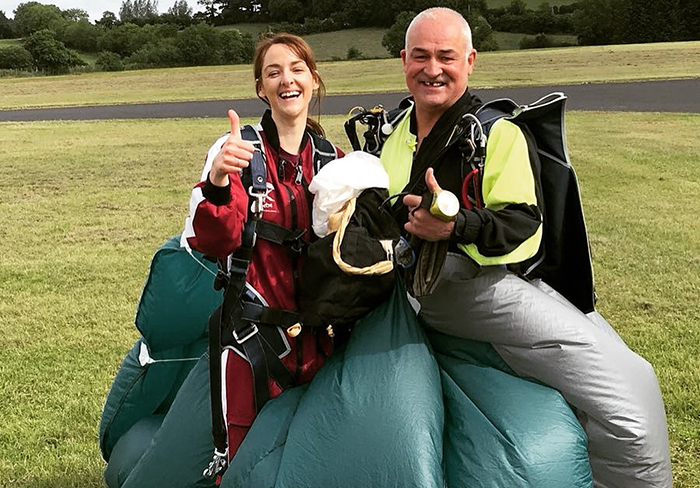 A number of brave William Coates staff took part in a Mencap NI charity sky dive in July. Mencap NI Down Royal Race Day Charity Auction Donations. 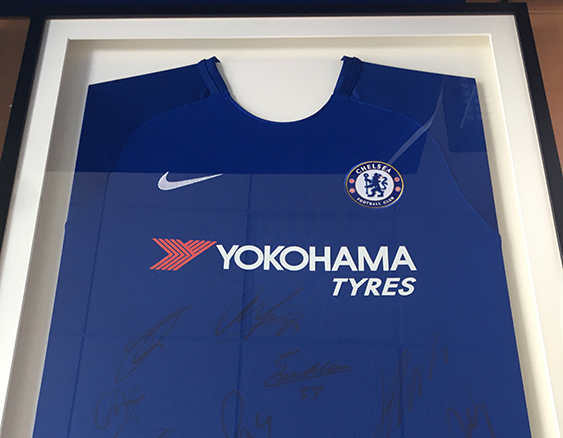 William Coates were pleased to donate a 2017 - 2018 signed Manchester City 1st Team Shirt and a 2017 - 2018 signed Chelsea FC 1st Team Shirt to the Mencap NI race day charity auction that was held at Down Royal Race Course on the 22nd June 2018. William Coates Office Staff V Site Staff Football Match. 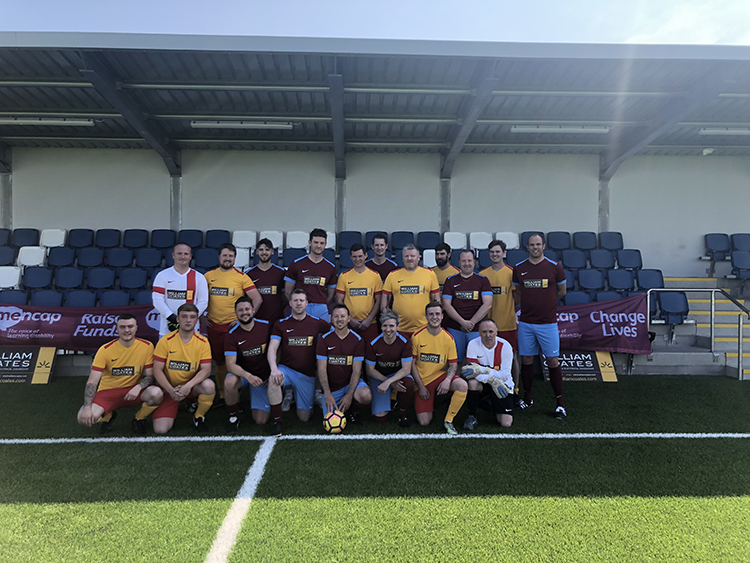 William Coates Office Staff V Site Staff Mencap NI charity football match held on Friday 8th June was a great success. William Coates Charity Pool Night for Mencap NI. 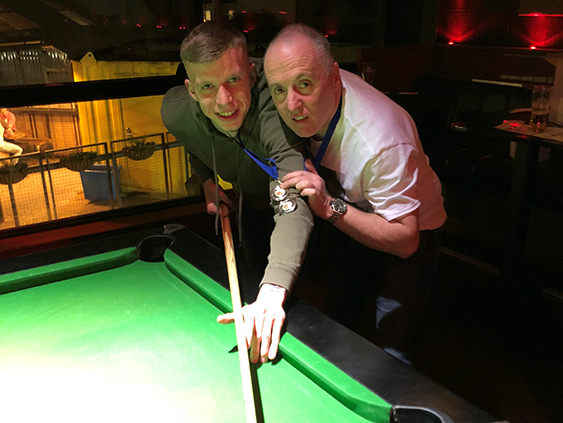 William Coates held a charity pool night to raise funds for our nominated charity Mencap NI. William Coates Staff Stress Work Shop. William Coates staff attended a Stress Awareness Workshop at head office this morning. William Coates Free Fruit Fridays. 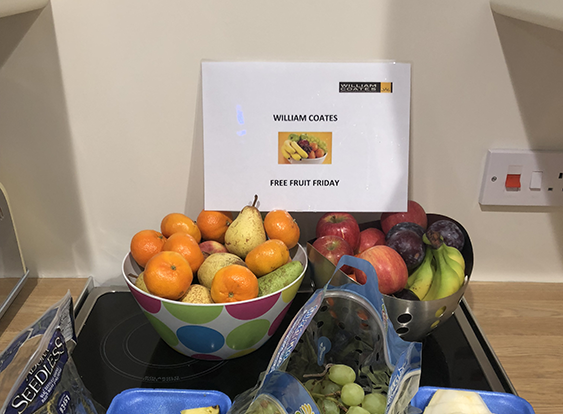 To promote healthy eating in the work place William Coates have implemented a monthly free fruit Friday initiative for all staff at head office. 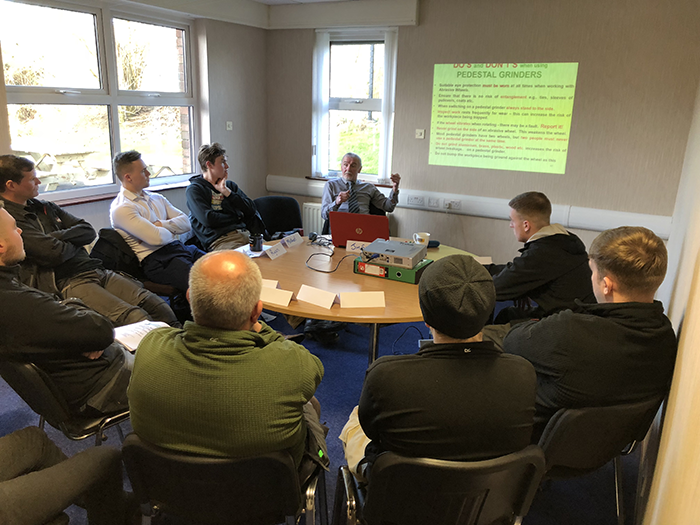 William Coates operatives recently attended an Abrasive Wheel training course held at head office. 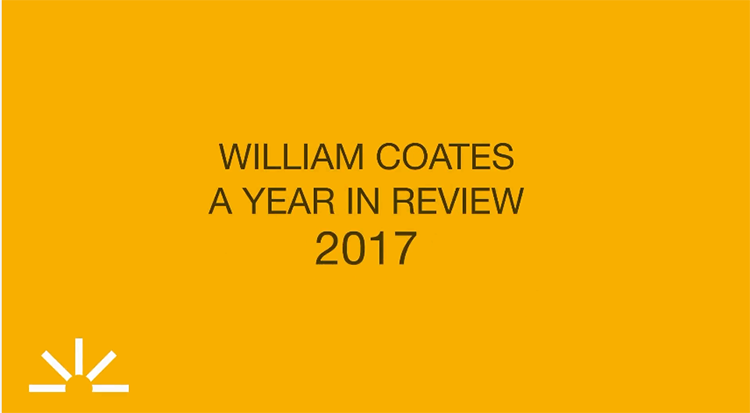 William Coates a Year in Review 2017. Please check out our William Coates a year in review video. We would like to thank all of our staff for all of their hard work in 2017 and we wish all of clients a Happy Christmas and Prosperous New Year. William Coates Mencap Charity Quiz. 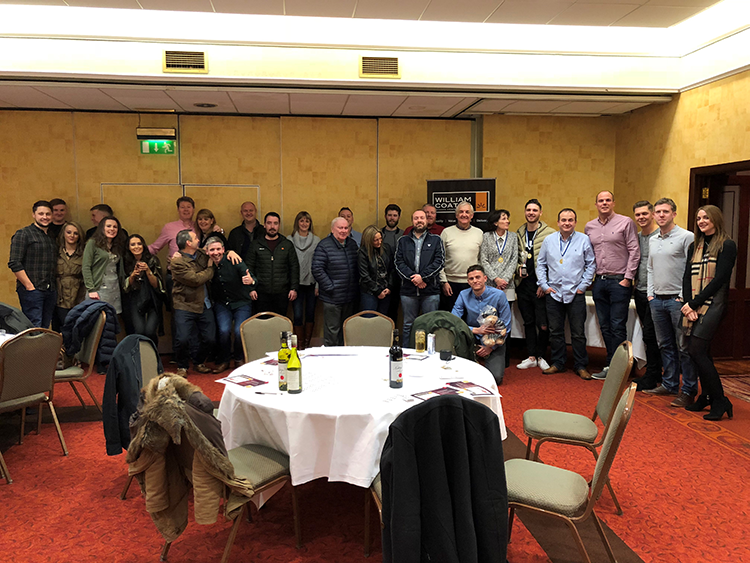 The William Coates staff enjoyed the recent quiz night held at Park Avenue Hotel, Belfast in aid of our nominated charity Mencap NI. 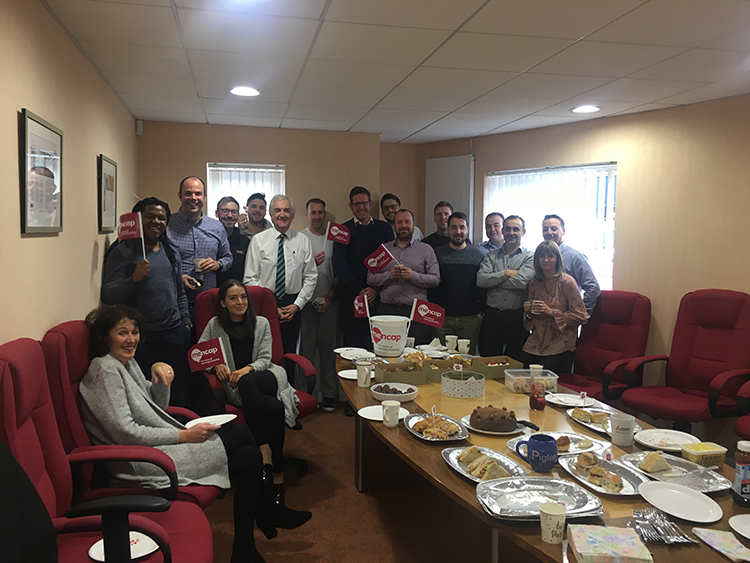 On Friday 17th November 2017 William Coates staff had a great morning at the Mencap Big Tea Party and we raised over £300 for our nominated charity. Mencap Charity Abseil Down the Iconic Europa Hotel, Belfast. A number of brave William Coates staff undertook the Mencap Charity Abseil down the Iconic Europa Hotel, Belfast. The weather was good and a great day was had by all participants and spectators. William Coates Family Fun Day. 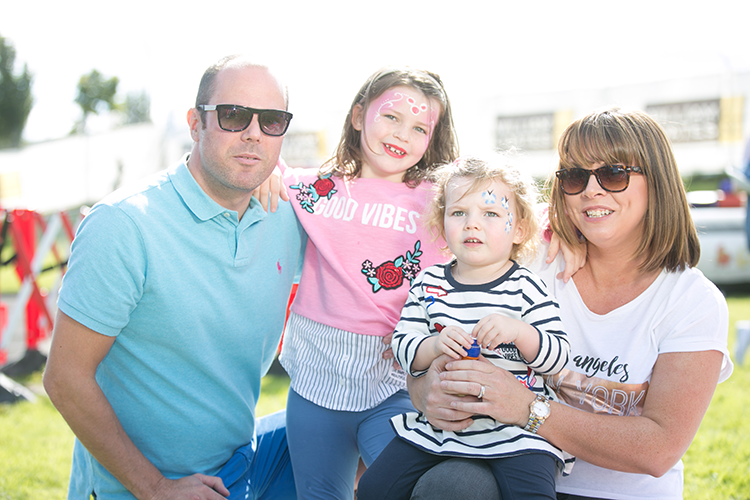 William Coates held a family fun day at its head office in Mallusk in September 2017. The day was a great success and all staff members and their family enjoyed all of the activities laid on for them as well as the BBQ and we raised money for our nominated charity Mencap. 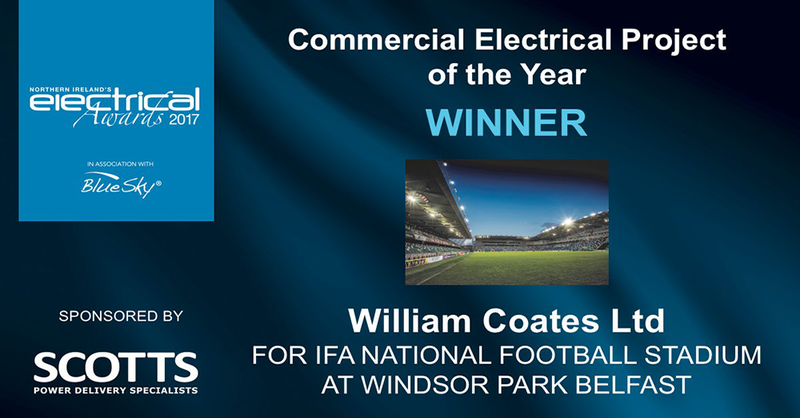 NI Electrical Awards 2017, William Coates Winner of Commerical Project of the Year 2017 for the Windsor Park Project. 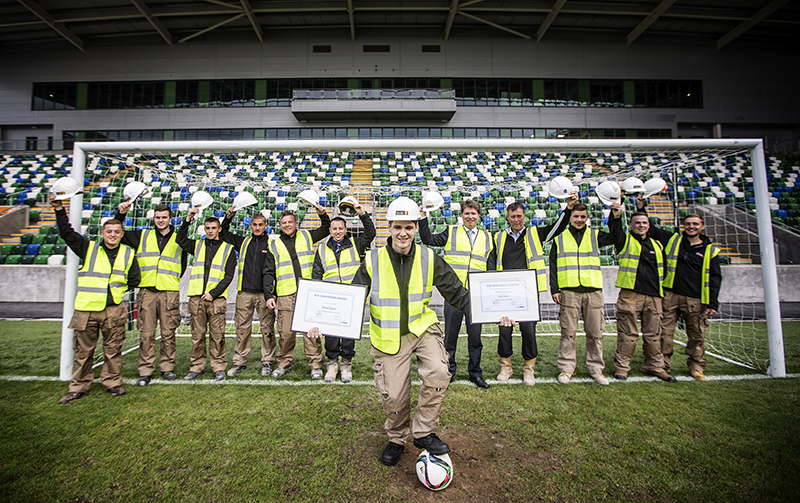 William Coates has scored another success for the company’s work on the redevelopment of the IFA National Football Stadium at Windsor Park in Belfast by winning the Commercial Electrical Project of the Year Award. Mencap Charity Zip Line over the River Lagan, Belfast. 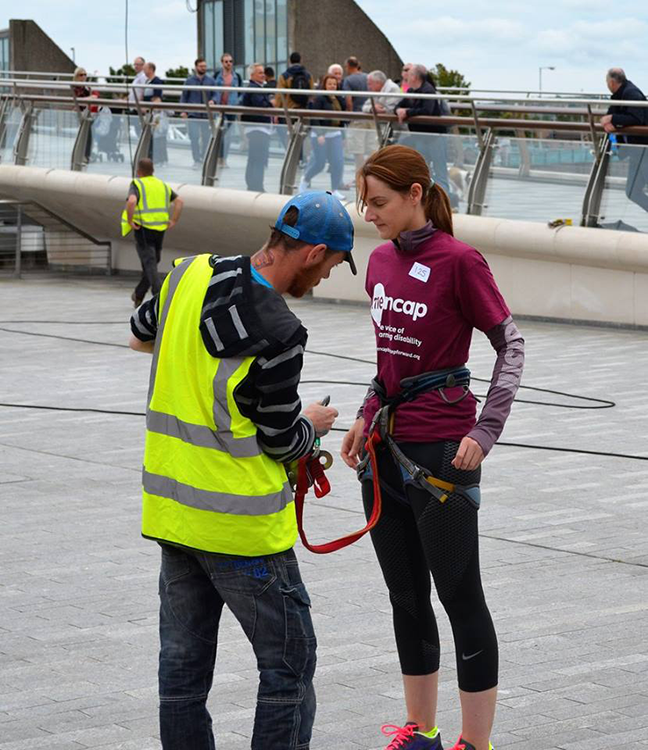 A number of brave William Coates staff undertook the Mencap Charity Zip Line over the River Lagan in Belfast. William Coates Site Team Donate to the Bouygues / Action Cancer Paint the Town Pink Chairty Fundraiser. The William Coates site team on the Bouygues Energy From Waste Project in Belfast made a generous donation the Action Cancer paint the town pink charity fundraiser. William Coates Donation to the Strangford College Book Fund. 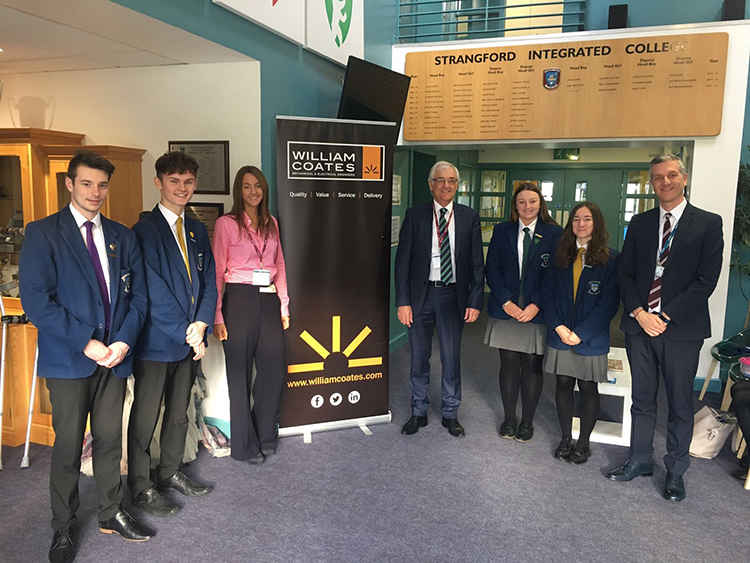 William Coates were please to make a donation towards the Strangford College book fund. 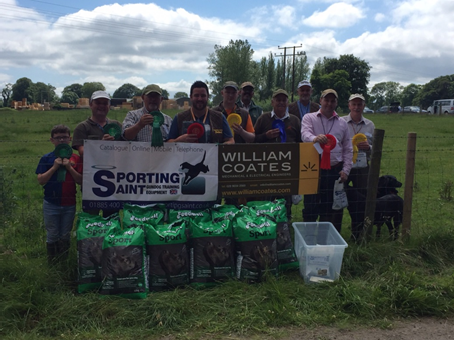 William Coates were pleased to be one of the lead sponsors of the Labrador Retriever Club of Northern Irelands field trails in June 2017. Bouygues “We Love Life” Health & Safety Campaign. 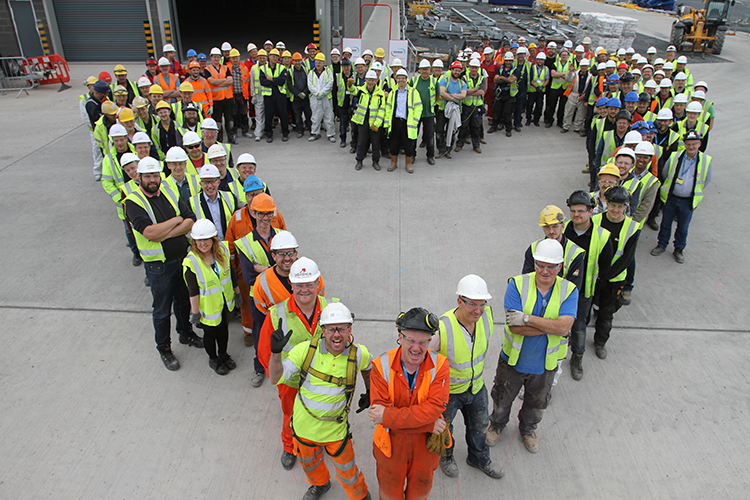 The William Coates team on the Bouygues Energy From Waste Project in Belfast were pleased to be a part of the Bouyges We Love Life Health & Safety Campaign. 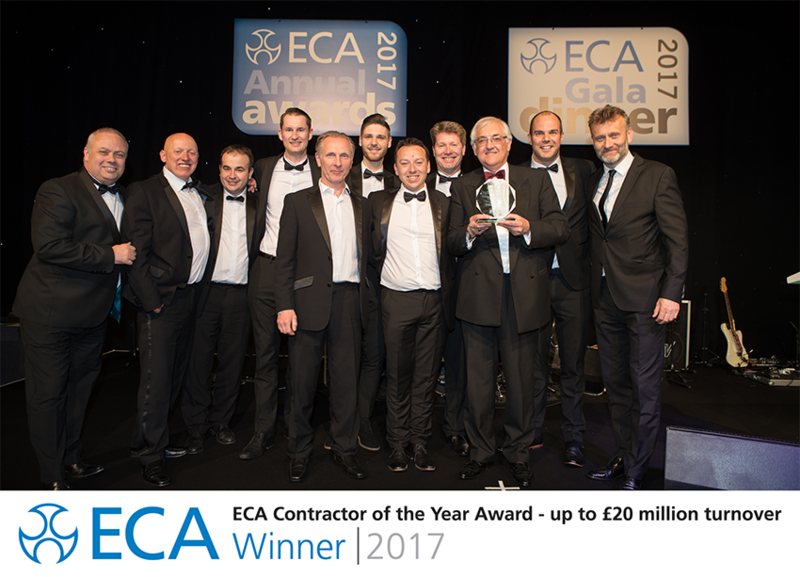 William Coates win the ECA UK Contractor of the Year Award 2017 up to £20 Million. William Coates, was one of eight top-performing businesses, from across England, Wales and Northern Ireland. 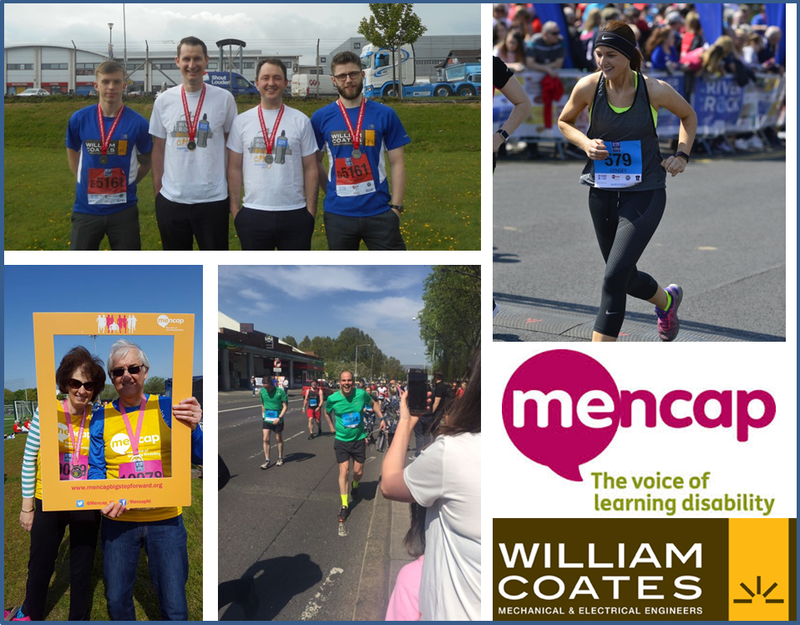 William Coates Belfast City Marathon Runners, Relay Runners & Walkers raised £2035 for Menap & £660 for the Motor Neurone Disease Association. Good luck to Team Moulds & Kirwin during the sidecar class British Championship 2017. 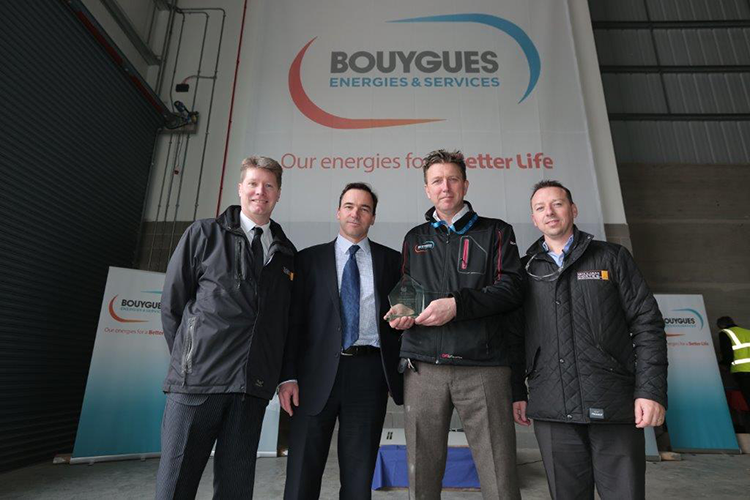 William Coates MD Paul Dickson and Director Gary Coleman at the EFW Project Ecosite Certification Award Ceremony alongside Stephane Frisch Bouygues Project Director and Bouygues HSE Manager Greg Hamill. William Coates are pleased to have recently completed the M&E services installation works to Belfast City Councils state of the art Olympia Leisure Centre, Belfast. Please check out our Olympia Leisure Centre project completion video. 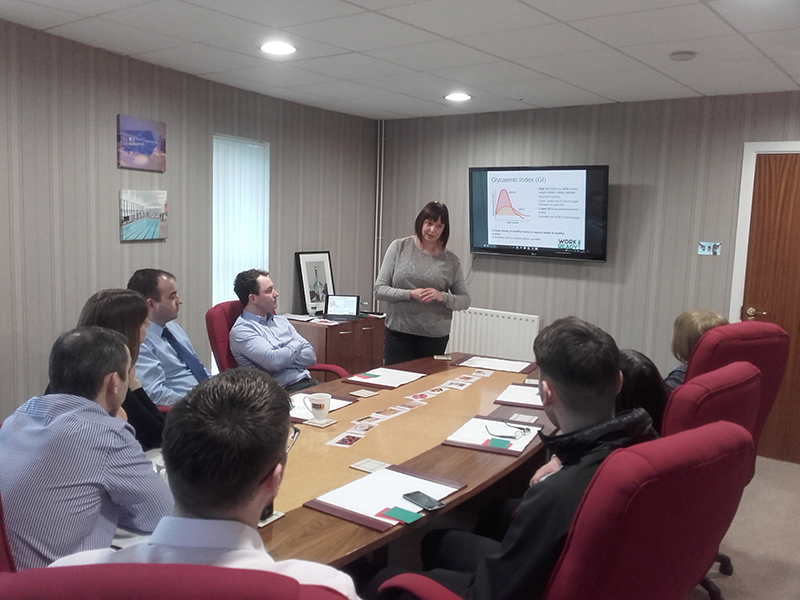 A Health & Wellbeing dietician came into William Coates head office on Wednesday 18 th January to carry out an Eat Well Feel Well Workshop for a number of William Coates office based employees. William Coates Cares @ Christmas 2016. 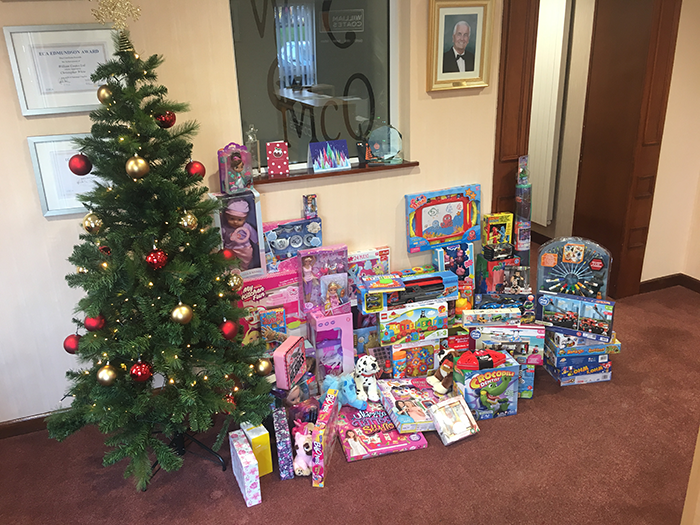 William Coates employees have been extremely generous and donated a great range of gifts to the Cares @ Christmas appeal for Action for Children NI. 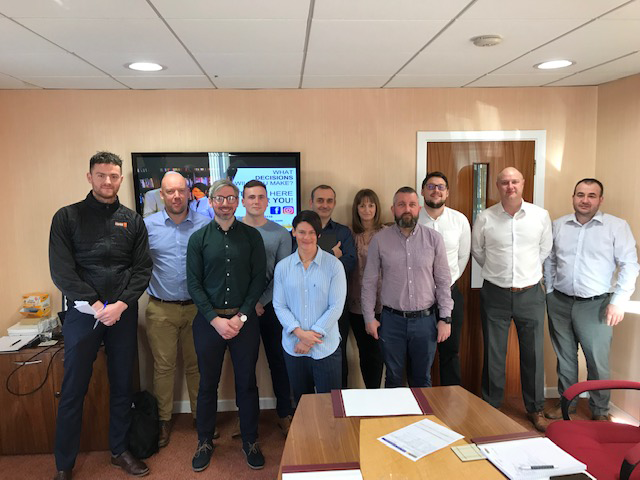 University of Ulster BEng Architectural Engineering and BSc Energy Students Visit the Bouygues Energy From Waste Project in Belfast. 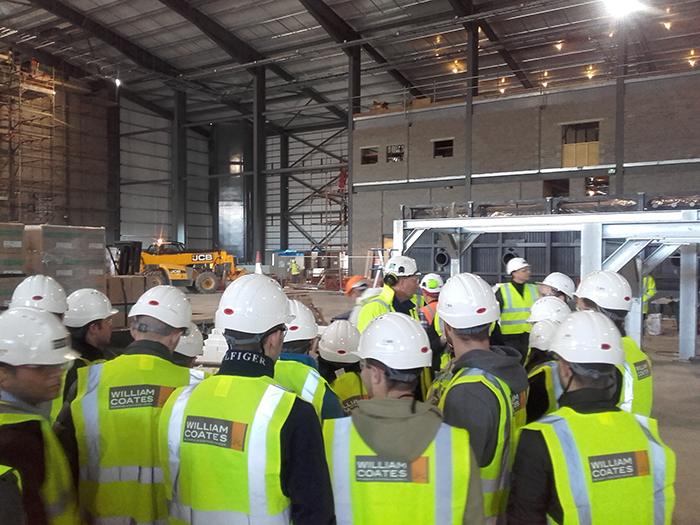 William Coates arranged for 29 University of Ulster BEng Architectural Engineering & BSc Energy Students & their lecturers to visit the Bouygues Energy From Waste Project on Monday 9th November 2016. William Coates Mechanical & Electrical Engineers recently attained UVDB Verify Status under the Achilles Utilities Vendor Database (UVDB) Scheme. 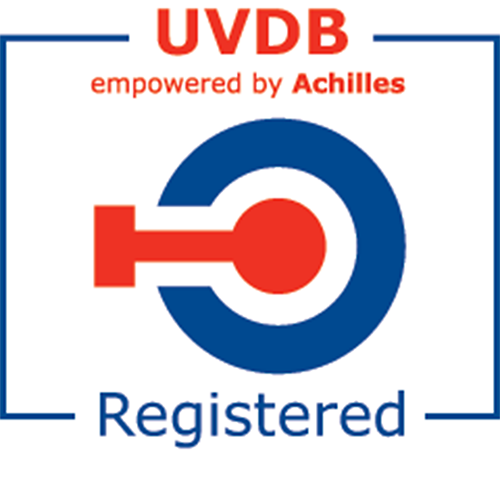 William Coates are pleased to announce that we have recently been awarded UVDB verify Status under the Achilles Utilities Vendor Database (UVDB) Scheme. 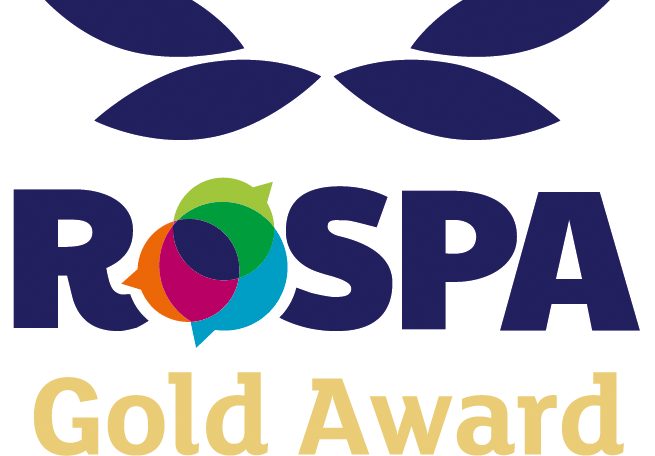 William Coates Mechanical & Electrical Engineers win Gold again at the RoSPA Awards 2016! William Coates Mechanical & Electrical Engineers has been successful in the 60th year of the RoSPA Occupational Health and Safety Awards 2016. 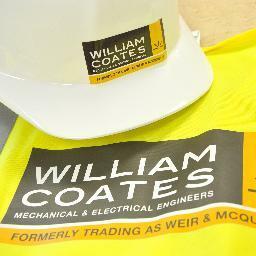 William Coates Windsor Park Project Completion Video. 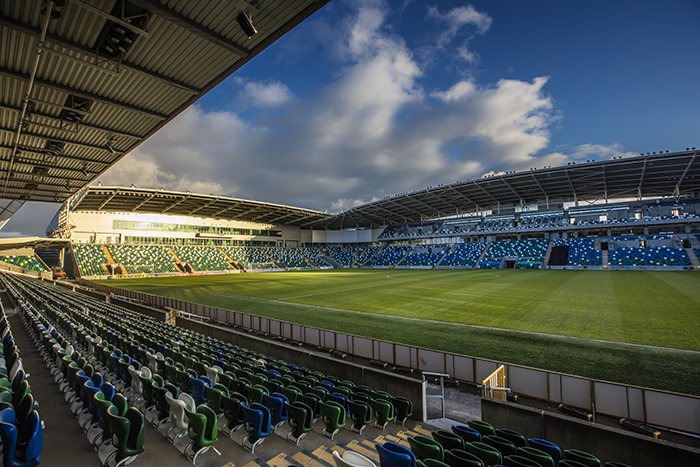 William Coates are pleased to have recently completed the M&E services installation works to the National Stadium Windsor Park Redevelopment Project. William Coates & BT Employees give a careers presentation to year 11 Pupils at Bloomfield Collegiate School, Belfast. 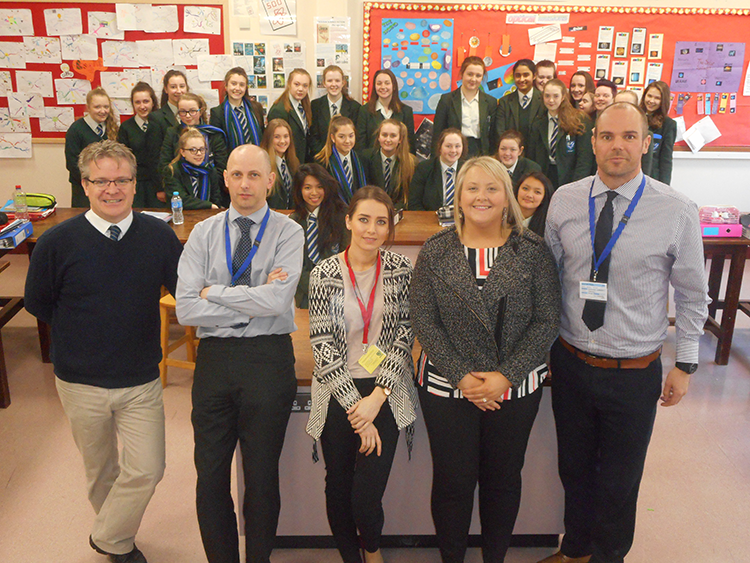 William Coates employees Jonathan Hunter, Ryan Scott and Saoirse Nibhroin and BT Project Manager Andrea Mercer gave a career presentation to year 11 pupils at Bloomfield Collegiate School Belfast. William Coates Employees Complete the 35th Belfast City Marathon on the 02-05-16. 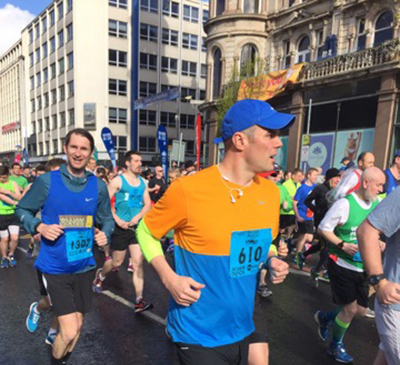 William Coates employees Ryan Scott & Philip Weir recently completed the Belfast City Marathon. Ryan & Philip raised £2553.00 for Mencap NI. William Coates provide a generous donation to the Bloomfield Collegiate School 6th form centre refurbishment Fund. 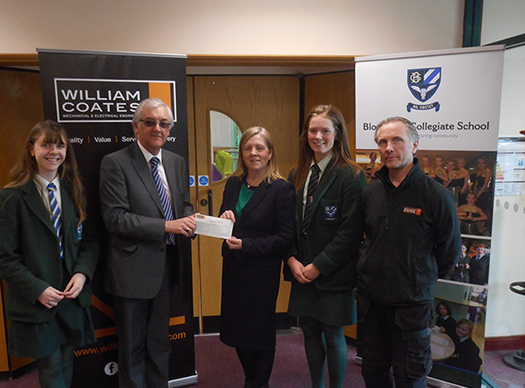 William Coates are currently working on a site adjacent to East Belfast's Bloomfield Collegiate School and we recently presented the School with a generous donation. 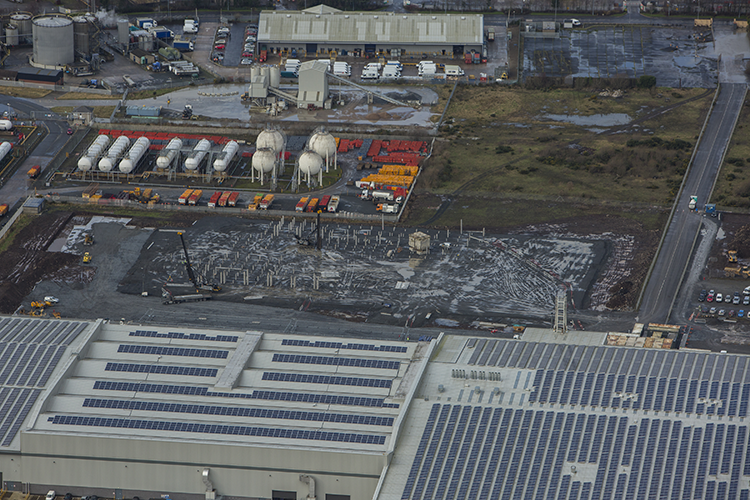 High Voltage Infrastructure Project for the EFW (Energy From Waste) Plant at Airport Road West, Belfast. 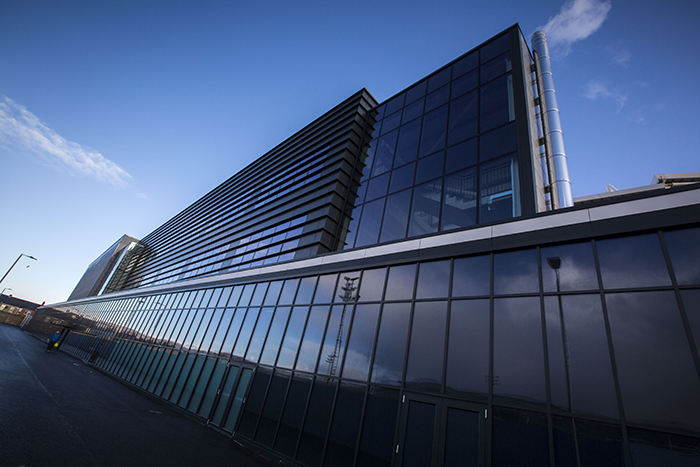 William Coates are pleased to announce that we have been awarded the High Voltage Infrastructure Project for the EFW (Energy From Waste) Plant at Airport Road West, Belfast. 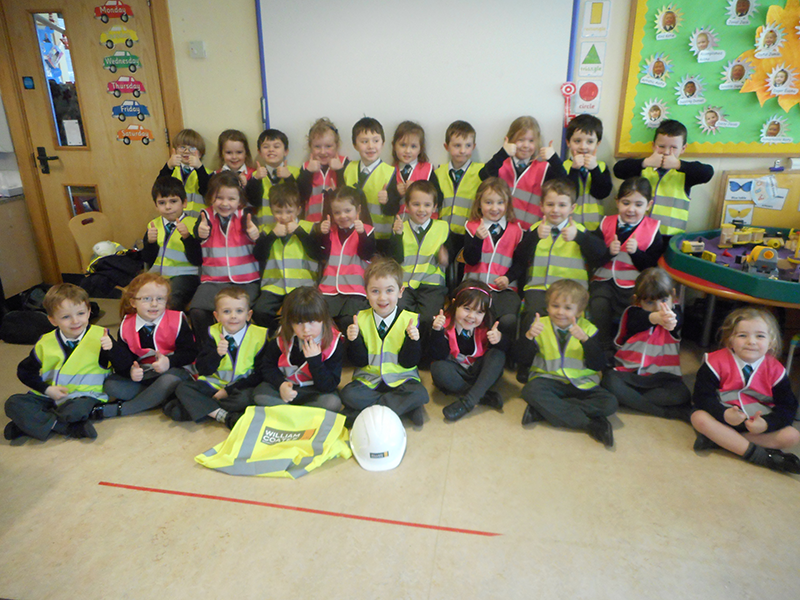 St. Ita’s Primary 1 Class, Construction Health & Safety Talk. William Coates Health & Safety Manager Ryan Scott was invited to give a presentation on Construction Health & Safety to one of St. Ita’s Primary Schools P1 Classes. Samuel McQuiston – 26.06.1929 – 16.01.2016. It was with deep regret that the directors and staff of William Coates Ltd. (formerly Weir & McQuiston Ltd.) learned of the death of Sammy McQuiston the company’s former joint managing director and joint owner. William Coates Cares @ Christmas. University of Ulster & Renewable Energy Students Visit the Windsor Park Project. 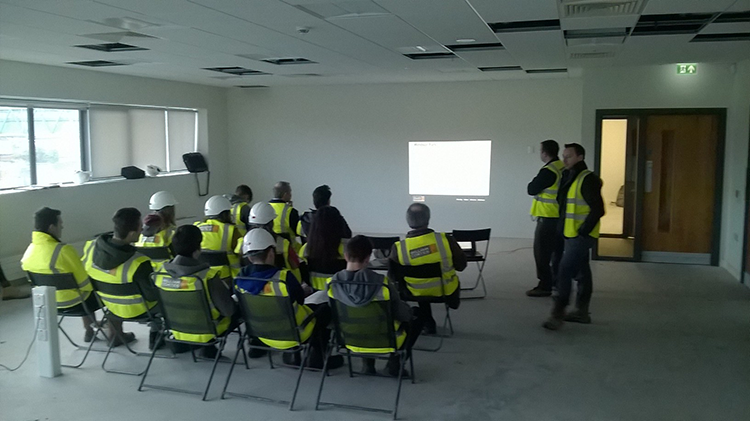 William Coates arranged for 30 University of Ulster & Renewable energy students & their lecturers to visit the Windsor Park Project on the 26-11-15. William Coates Employ Two Long Term Unemployed Persons on the Windsor Park Project. 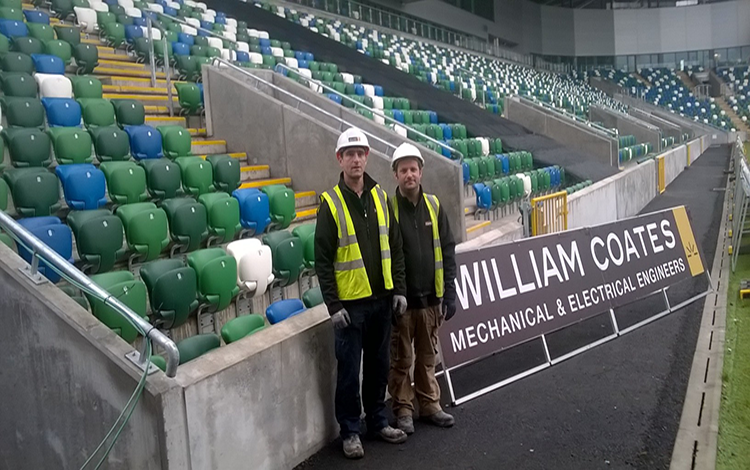 William Coates are pleased to announce that we have employed 2nr Long Term Unemployed persons on the Windsor Park Project. 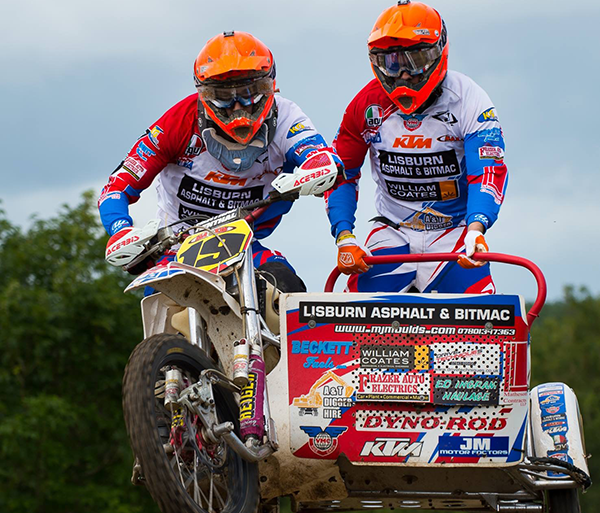 William Coates Sponsor Team Moulds and Gardner Sidecarcross for the 2015 Season. 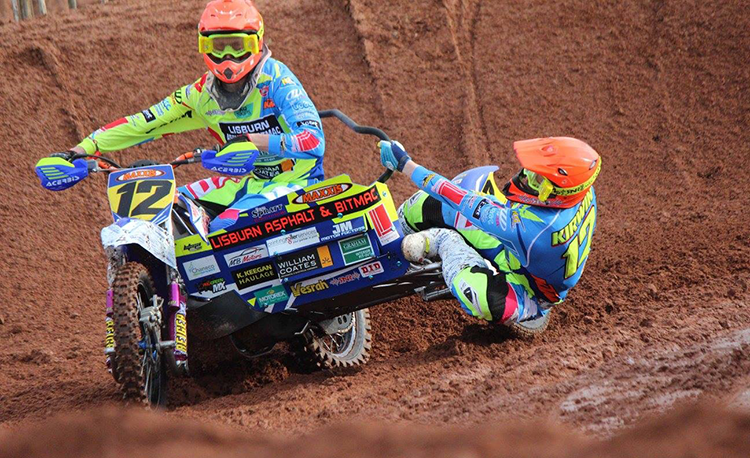 William Coates are pleased to announce the William Coates Sponsored Moulds and Gardener Sidecarcross Team have had a successful year in the British Championship finishing 9th and 2nd in the British expert’s championship. William Coates Scores Apprentice Award Hat Trick! William Coates, is celebrating a hat trick as the company has scooped the Northern Ireland ECA Edmundson Electrical Apprentice of the year Award, the premier awards in the electrical installation industry, for the third year in a row. William Coates, Lagan Walkways Lighting Upgrade Project. 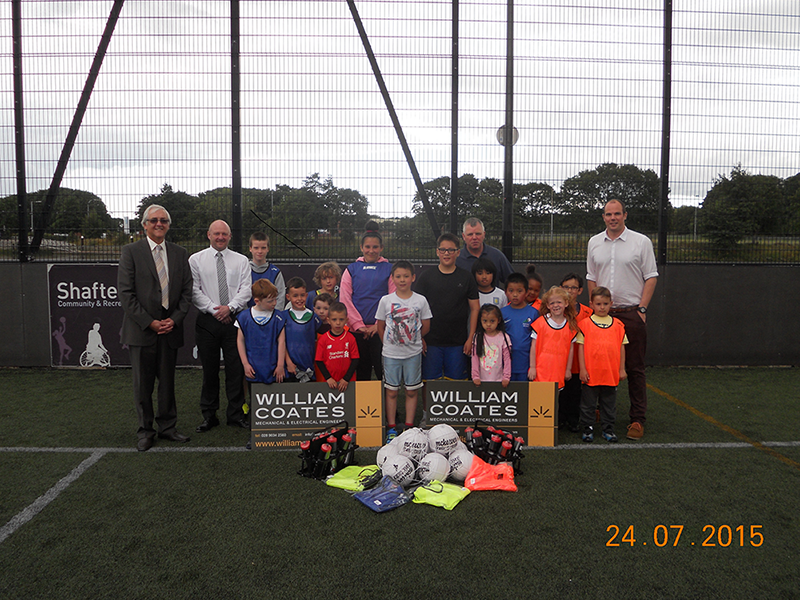 William Coates made a donation of water bottles, training mesh bibs and Gaelic footballs to the local Gaelic football club St Malachys which associated with the Shaftsbury Community & Recreation Centre, Ormeau Road, Belfast. William Coates Relay Team Complete The Belfast City Marathon. 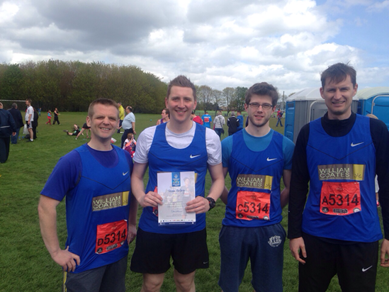 William Coates 5 man relay team completed the 26.2 Mile Belfast City Marathon. Mossley Primary School Maths Day, May 2015. In May 2015, our Senior Electrical Contracts Manager Gary Coleman was invited to speak at Mossley Primary School’s maths day.